With affordable insurance products to help Filipinos avail of financial services and privileges that higher-income earners have easy access to, we offer innovative microinsurance products and services that promise to minimize impact of distress and misfortune on one’s financial position. 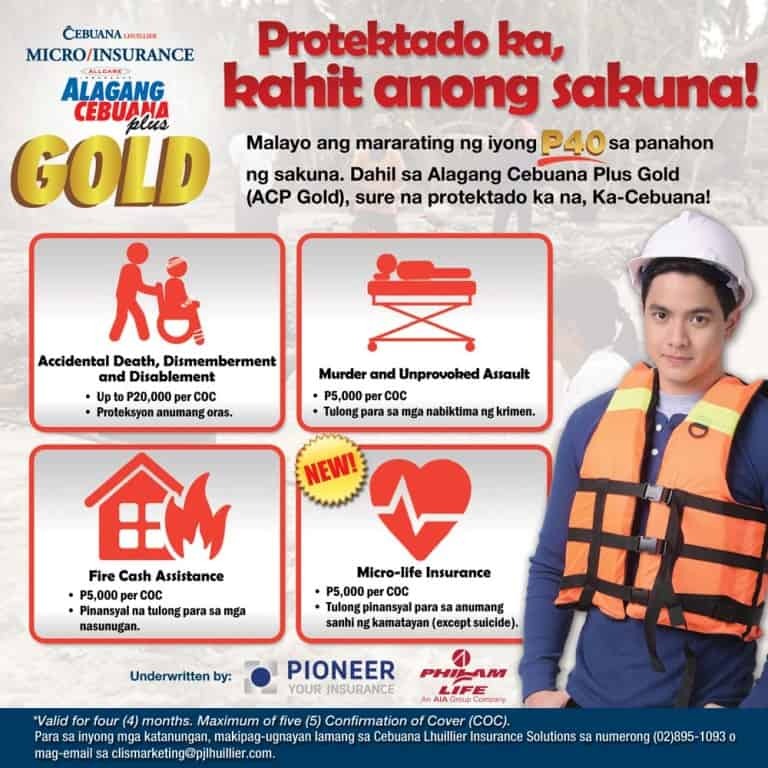 Alagang Cebuana Plus Gold is a microinsurance product designed for individuals aged 7 to 70 years old with coverage of Accidental Death/Dismemberment & Disability (ADD&D), Fire Cash Assistance (FCA), rider benefit for Unprovoked Murder and Assault (UMA), and a micro-life insurance. ACP Gold is a 24/7 Personal Accident Insurance with worldwide coverage! For as low as P40, each certificate is valid for four (4) months and can be availed up to a maximum of 5 certificates per insured. Only a maximum of five (5) certificates or P25,000 can be claimed per individual member. The date the Policy terminates or four (4) months after effectivity date. The date the member enters military, naval, or air service. The date member reaches the age 71. All certificates in excess of five (5) person shall be declared null and void. Written notice of claim must be given to Cebuana Lhuillier in any of its branches nationwide immediately after the death of the insured. 1) No benefit shall be paid if the cause of death is suicide committed within the first four (4) months of the member’s insurance coverage. In case of a member’s “continuous insurance coverage”, death by suicide shall be compensable if committed after the first four (4) months of insurance coverage. “Continuous insurance coverage” means that the member’s insurance coverage under this Group Policy has no gap whatsoever. c.) the development of such illness or condition started whether or not the Member is aware of such illness or condition. A) A certified passenger aircraft provided by a regularly established airline on any regular scheduled flight and operated by a properly certified pilot flying over an established aerial route between duly established and maintained airports. B) Any transport type aircraft by the Military Airport Transport Service (MATS) of the United States or by the similar transport service of any duly constituted governmental authority of the recognized government of any nation anywhere in the world. “Loss” as above used with reference to hand or foot means complete severance through or above the wrist or ankle joint, and as used with reference to eyes means the entire and irrevocable loss of sight. The occurrence of any specific loss for indemnity is payable under this Part shall at once terminate all insurance under this Policy, but such termination shall be without prejudice to any claim originating out of the accident causing such loss. No indemnity will be paid under any circumstances for more than one loss, the greatest, for which provision is made in this Part. In the event of accidental death of Insured, the principal sum benefit shall be paid to the beneficiary indicated in the Insurance stub, otherwise if there are no beneficiaries designated at the time of the Insured Individual’s death, or if the designated beneficiaries did not survive the Insured Individual, the beneficiary shall be the surviving class of the following classes of beneficiaries in successive preference: the Insured Individual’s (a) widow or widower, (b) children, (c) parents, (d) brothers and sisters; otherwise, the Insured Individual’s estate. All other benefits shall be payable to the Insured. Dismemberment/Disablement is subject to the Table of Benefits of the Standard PA policy. Notwithstanding the Principal Sum stated in the Policy to which this is attached or as amended by other endorsements to the policy. It is hereby declared and agreed that Murder and Unprovoked Assault are deemed cover under the policy at 25% of the A D & D limit. Any bodily or mental infirmity, disease or sickness, or infection occurring because of an accidental cut or wound. This exclusion does not apply to Daily Sickness Hospital Benefit, if attached to this Group Policy. Any Act of Terrorism or any action taken in controlling, preventing, suppresssing, or in any way relating to, any act of terrorism. For the purpose of this exclusion, an “Act of Terrorism” means an act, including but not limited to, the use of force or violence, atomic/biological/chemical weapons, weapons of mass destruction, disruption or subversion of communication and information systems infrastructure and/or the contents thereof, sabotage or any other means to cause or intended to cause harm of whatever nature and/or the threat of any of the aforementioned acts, of any person or group(s), whether acting alone or in behalf of or in connection with any organization(s) or government(s), committed for political, religious, ideological or similar purposes including the intention to influence any government and/or to put the public, or any section of the public, in fear. In the event the person is not qualified due to age, or number of Confirmation of Cover (COCs) or any other cited ineligibility, the COC may be given to another qualified person. All COCs in excess of 5 per person shall be declared null and avoid. Written notice of injury on which claim may be based must be given to the Company within (30) days after the date of the accident causing the injury. In the event of accidental death, immediate notice thereof must be given to the Company in any of its branches. And other necessary documents that may be required by Pioneer Insurance. This Confirmation of Cover is intended to be a general summary. For full details on terms, conditions, exclusions and provisions of your coverage, you may request a copy of the Master Policy. 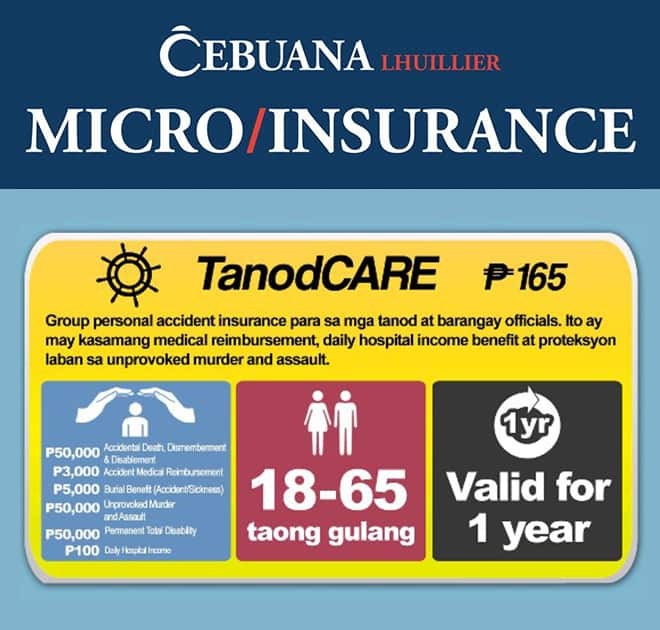 TanodCARE is a Group Personal Accident Microinsurance specially designed for barangay tanod officials and its members/personnel. This micro-insurance requires a minimum number of 30 enrollees aged 18 to 65 years old, enrollees above 65 years old will be accepted subject to 50% cover of Sum Insured for all Benefits. This insurance requires a minimum number of 10 enrollees aged 18 to 65 years old. Enrollees above 65 years old will be accepted subject to 50% cover of Sum Insured for all Benefits. *Please contact/email CLIS at Direct Line 895-1093 or email clismarketing@pjlhuillier.com for more information. AutoCARE Insurance is a Standard Comprehensive Car Insurance that covers Own Damage (OD), Theft, Loss and/or Damage. Excess Bodily Injury (EBI), Excess Property Damage (EPD), and Acts of God/Nature (AOG/AON). MotorCARE Insurance is a Standard Comprehensive Motorcar Insurance that covers Own Damage (OD), Theft, Loss and/or Damage, Excess Bodily Injury (EBI), Excess Property Damage (EPD), and Acts of God/Nature (AOG/AON). Insuremed is Personal Accident insurance program designed for consumers of medicines and other pharmaceutical products. It covers Accidental Death, Dismemberment and/or Disablement (ADD&D), Murder and Unprovoked Assault (UMA) and Fire Cash Assistance. NegosyoCARE is a Personal and Property Insurance specifically designed for clients with micro, small, and/or medium enterprises or businesses. It covers property insurance, burglary and robbery, accidental death, permanent disablement and dismemberment, accident medical remibursement (AMR), and money, securities, and payroll coverage. NegosyoCARE is underwritten by Bankers Assurance Corporation (BAC). HomeCARE Insurance is a very affordable Residential Fire Insurance coverage. It offers loss protection to buildings and residential dwellings including their contents against perils of fire, lightning and other allied perils such as earthquake, typhoon and flood. HomeCARE is underwritten by Federal Phoenix Assurance Company (FPAC). Visit any Cebuana Lhuillier branch. Request for your preferred microinsurance policy. Present the payment for the Certificate of Cover. Accomplish and sign the Certificate of Cover. Claimants must present all required and valid documents listed under each type of claim at any Cebuana Lhuillier Pawnshop branch. NOTE: Only claims below P50, 000 are payable in cash. Claims above P50, 000 shall be through check payment. “Lubos kaming nagpapasalamat sa Cebuana Lhuillier Pawnshop sa kanilang Alagang Cebuana Plus, dahil hindi nila kami pinabayaan sa oras na kailangan namin sila. Kahit naubos ang aming kagamitan at bahay dahil sa sunog, binigyan nila kami ng pag-asa. Sa halagang P5,000 na fire insurance assistance na bigay ng Cebuana, nakapagsimula muli kami. “We don’t know how to express our heartfelt thanks to your good office for the unbelievable action agad to the family sufferings. Before, I thought it was just a hearsay or sort of an advertisement, but I was mistaken. You’re true Filipino with an open arms and heart to help others. Therefore, I salute you for the good work and I hope and pray it will last forever. Keep up the good work, more power and God Bless. “The billboard industry felt the brunt of typhoon Milenyo’s fury when it hit Metro Manila and nearby provinces last September 28, 2006. Our company was not spared. One of our billboards which was installed on the rooftop of a building collapsed and fell on the roof of the adjacent building. Fortunately no one was hurt and the only damages incurred were on the roofs of the two affected buildings. But thanks be to God and Cebuana Lhuillier Insurance Solutions, the insurance agency which services our non-life insurance needs. When the unfortunate event happened, we immediately reported the incident to CLIS. The staffs, Ramon Gonzalez in coordination with Jeric Timbol, were very enthusiastic to assist us. In less than 3 months we were able to get our check representing the insurance coverage of our billboard. 1. Am I required to avail of Alagang Cebuana Plus Gold personal accident microinsurance? Our Alagang Cebuana Plus Gold personal accident microinsurance is optional. However, we highly recommend that you avail of it, considering the premium benefits that you will enjoy if you have one. For only P40 per certificate, you will have P35,000 personal accident coverage plus P5,000 fire cash aid for four months. 2.What is the period of coverage of your Alagang Cebuana Plus Gold personal accident microinsurance? 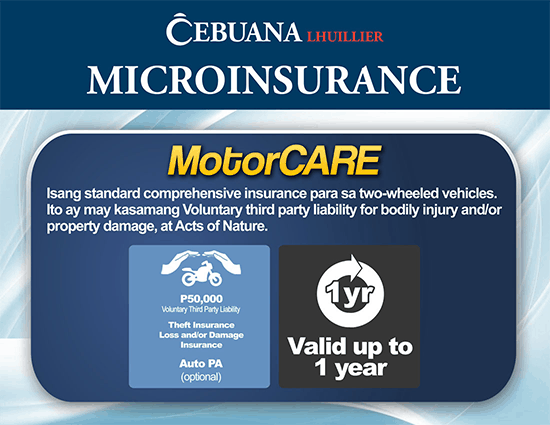 Each Alagang Cebuana Plus Gold personal accident microinsurance certificate is valid for four months from enrollment. You must renew your ACP certificates after four months to continue your eligibility for the claiming of benefits should the time of need arise.